There are a number of kung fu movies championing crazy, innovative stylistic creations to differentiate themselves from bucket-loads of other titles, everything from Chess Boxing to Drunken Fist to spiritual fighters, ‘sleeping style‘ and ‘emotional kung fu‘. 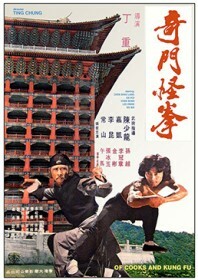 This champions the unique style of cooking kung fu – “known only to chefs!” according to the dubbed mid-Atlantic introduction. Jacky Chen throws his arms around shouting out popular dishes – “fish balls!”, “beggar’s chicken!”, “flying chopstick!” – aptly demonstrating his so-called ‘kitchen style’ kung fu taught to him by his moody granddad – the former King of Chefs. He was once the Empress dowager’s personal cook until she broke her tooth on one of his scallops. A mysterious assassin in Imperial garb strolls into town, demanding to know the whereabouts of the former chef master, and it eventually falls upon the young hero to serve up a deadly meal of retribution. The dubbing team have good fun with the food theme, including lines like, “my kung fu will make mincemeat of you”. Perhaps more could have been done with the cooking concept; too much time is dedicated to Jacky Chen’s over-acting and two embellished poop gags, which is probably too many by most people’s standards. But at least the film attempts something a bit more abstract than your average chopsocky. Not one to watch on an empty stomach. Studio: Great China Film Co.